If you’re like me, you’ve been putting off your purchase of a Ferrari 488 GTB because you know at some point you’ll have to use it to transport a 5 foot-tall ficus tree from the garden store, and, really, you just can’t. Until now. Here’s the first image of the 488 Spider, a Ferrari whose opening roof will allow it to transport small trees. 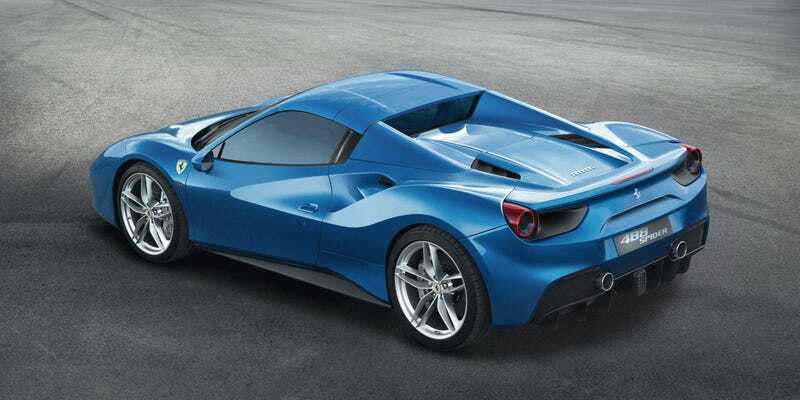 According to Ferrari’s press release, the 488 Spider is the “most powerful ever mid-rear-engined V8 car to feature the patented retractable hard top” and they claim it actually weighs about 50 lbs less than a comparable soft top. 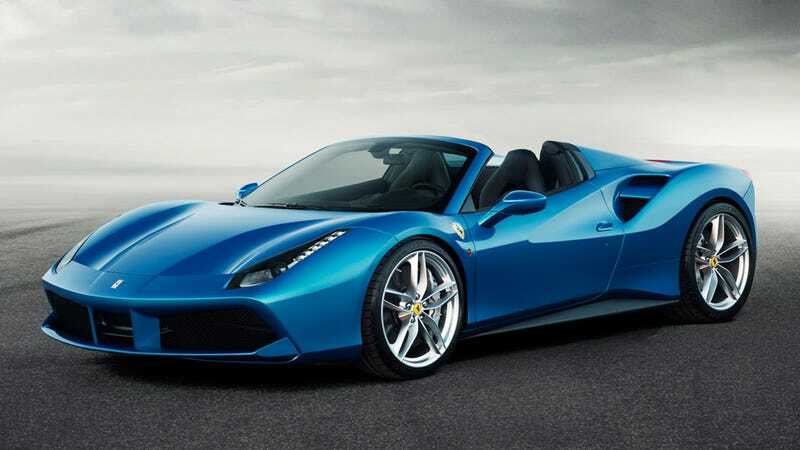 The 488 Spider has the same 3.9L turbo flat-plane V8 from the 488 GTB, which makes about 660 HP/560 lb-ft, good enough to go from a dead stop to 60 mph in 3 seconds flat. That should be adequate to get a ficus tree in the passenger seat completely denuded of leaves. In line with Ferrari tradition, this model has its own absolutely distinctive soundtrack created using solutions such as exhaust headers with longer, equal- length piping and a flat-plane crankshaft. It was also further enhanced by an in- depth study of harmonics and tonality at different engine speeds. The sound is seductive but never invasive when the top is dropped, with both volume and clarity increasing as the engine instantly responds to the accelerator pedal and revs rise, reinforcing the sensation of massive performance. It’s Ferrari’s most aerodynamic Spider ever, and managing airflow around an open-topped car is always a challenge. The buttresses and massive intakes from the closed car are all still here, though for some reason in the Spider those gaping maws of intakes right behind the doors seem capable of sucking your watch off if you rest your arm on the door. The RHT folds backwards in two overlapping sections to rest flush on theengine in a very compact solution. The mechanism is exceptionally smooth andtakes just 14 seconds for the top to fully retract or deploy. The Spider will be physically revealed to the peoples of Earth in September at the Frankfurt Motor Show. No pricing has been announced just yet, but I’m sure it’ll be very reasonable.